I suppose now that I have made myself appear both insane and irritating I should say that it’s all done in good humor. I put my fingers in a V and point them at my eyes when I say “Focus!” I then clench my fist and hold it in front of me and rasp “Discipline!” Then I laugh. Discipline, though, is no laughing matter. I imagine that you could meet the richest people in the world and you would find that few of them (other than those who inherited wealth) were lazy while they were building their wealth. I also doubt that you would find a significant portion of them to be severely overweight, drug or alcohol abusers or big fans of TV. Most of them would have the discipline to exercise control over almost every part of their life that did not involve building their business or perfecting their 3-point shot or making the perfect CD. Even Britney Spears had to be disciplined before her recent troubles. I sincerely doubt – even though I frequently disparage her singing – that I could sing and dance even to her level. Not that I would try – nobody wants to see me singing in a schoolgirl’s uniform, anyway. And I wouldn’t think of discipline as being solely about an unending focus on money, either. A person who is rich, or who has financial freedom, or who simply knows what their goals are also must have the discipline to maintain a personal life. A disciplined business person should bring that same discipline to their relationships with friends and family and community, knowing that real success isn’t possible with money alone. If it was, we wouldn’t see horror stories about lottery winners flaming out after winning the lottery. Discipline is one of the two most important characteristics you can build INTO yourself. I don’t think anyone is naturally self-disciplined or naturally undisciplined. It’s a simple matter of establishing patterns and altering your behavior consistently. You establish the patterns that lead to discipline. If you tell yourself that you will stop cursing, for example, you have to set goals and rewards when you don’t curse (if you go a whole day with no cursing, add a dollar to a “gift to me” jar, for example). You can also use negative reinforcement like I do – my rubber band works wonders, believe it or not. All desire, impulses, physical sensations, etc. are driven by your mind. Imagine you are happy now, and you can make yourself happier. Self-discipline is a negative force that must be used in a positive way – it is the denial of something else. Make sure that you associate your self-discipline with positive ideas, too. Don’t just think of denying yourself the chocolate cake slice – think of getting rid of fat man pants. There is no discipline without a goal. I can exercise self-discipline to prevent myself from touching a watermelon for the rest of my life -but it makes no sense and it can’t be articulated as a meaningful goal. Without a goal, your self-discipline is a waste of breath and time. To get self-discipline, zero in on gratitude. Remember that you have been given the opportunity to make your own decisions, and that’s something to be exceptionally grateful for. Apply your mind today to the concept of self-discipline. Establish a pattern: no carbs after 6 pm, no more trading stocks without studying financials, no more credit card debt, whatever you are attempting to achieve. It is as simple as flipping a switch in your mind. 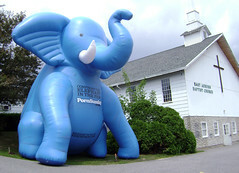 People may tell you that is not true, but let me give you a final example: do NOT imagine a blue elephant. Do NOT picture it in your mind. When you can read that and not imagine a blue elephant, you get a picture of what real self-discipline can be. Just focus your mind on goals, not the problem itself. I think visualizing your condition once you’ve completed the goal is as important – or even more important – than trying to avoid the negative behavior. That is what self-discipline is all about. This is a continuation of my series on Napoleon Hill’s book Think and Grow Rich that began with this post. However, I think the key to self-discipline is having a plan….or at least a vague idea of what you want. Your rubber band idea is similar to the idea behind the bracelets at http://www.acomplaintfreeworld.org. But when you complain you don’t snap them, you just switch them to the other wrist and start over with counting to 21 consecutive days without complaining. That is so very true. I do think that if you are not naturally self-disciplined then it is very hard to change. My husband is not at all self disciplined and I am extremely disciplined. This meansthat we have a relationship where I nag him and he tells me to relax – surprisingly it works very well! I do feel sorry for him though, as he tried really hard to be well discipline dbut it just doesnt seem to be in his nature. Napoleon Hills book was the first motivational book on self improvement that I ever picked up. My philosophy teacher recommended it to me. Definitely, self-discipline is a crucial behavioral characteristic to have. It is much easier if you grew up with discipline as a child, but even as an adult you can learn it. It’s all about making it a regular part of your environment, after a while it becomes a part of you. Nice post. What a world it would be if each one of us could self discipline ourselves. Yeah it’s quite hard to learn when your an adult and thats why all children should be taught discipline at a early age. Remember that even if you can’t attain a goal through self discipline or if you just keep falling short, you have to keep on pushing yourself to reach that goal or to develop that habit. A big problem with many people is feeling bad in the morning. Becoming a morning person does not depend on your mood in the morning but rather how you perceive your morning to be the night before. Fall asleep thinking that in the morning, you will get up, you’ll make some coffee, you’ll have time to enjoy it and then you’ll start off with your day. Instead of waking in the morning and thinking I have to get up now because I’ll be late and then I have to go to work and such. Adjust your mindset. Love this post. NYTimes.com recently had an article about willpower, another word for discipline. The article, written by some psychologists, says that you can actually increase your willpower through training, much like a muscle. Even better, your increased willpower in one area (like exercising more) can spread to other areas of your life (like eating better and watching less TV). I like the switch idea. If you go to hand to hand combat with something luring you away from your regimen – you lose more often than not. The only one that worked with was Odyseus when he had himself tied to the mast. I’ve had some success with associating certain nondesired behaviors with triggers that engender certain behaviors that help me not dwell on the blue elephant.Some times it’s just get up and move when that subject comes up. Right now I use a lot of tight time constraints that if I go over I stop the activity finished or not and go on to the next thing on my list.